28 Days into my Paruresis Recovery, and where do I stand? That’s a major step for me that has become easier and easier to deal with. I still can’t believe that I can pee under those circumstances with another man just inches away. Now that I’ve been doing at home desensitization for 28 days, it’s time I took maters out to the field: Public Bathrooms! So my goal this week was simple; to physically enter two public bathrooms, and do nothing more than to stand at a urinal for 3 minutes. But to a Paruretic, me, it’s my worst nightmare! I dread stepping foot in public restrooms. In fact, I do everything I can to avoid them like holding in my urine for 8 hours at a time (bye bye kidneys). I fear restrooms. I loathe them. My bladder locks up and I could almost never ever pee in them (even in enclosed stalls). It’s too quiet in here. I can hear footsteps. People are chatting, laughing. The door’s opening, Someone’s crapping in the next stall. OMG… Crazy stuff! It’s a social phobia that has plagued me my whole life. And if you want to know how bad my condition gets, understand this; I have only approached a urinal maybe 5 times in my entire life! (maybe 4?). And only one time, ONE TIME, have I ever peed into one, and that was just a couple of weeks ago. So you can see how urinals and me do NOT get along! That’s why forcing myself to enter a bathroom and to stand at a urinal is difficult and trying. It’s my highest trepidation. I really can’t even imagine it! So today, being Saturday, the last day of the week, I knew I only had one shot left to accomplish my goal. Yesterday I made myself (after a dozen other failures) to enter a bathroom and stand at a urinal (at a charity event). Today I do it again! Me and my friend are heading into Target, I tell Mike that I need to use the bathroom “to desensitize“. “Go ahead” he says “I’ll be up front…” And then he pauses, looks at me and says “Take as long as you need“. He understands my situation. Things like that are why he’s been my best friend for over 17 years. A true friend! So I go left and Mike continues on. I head into the men’s room. 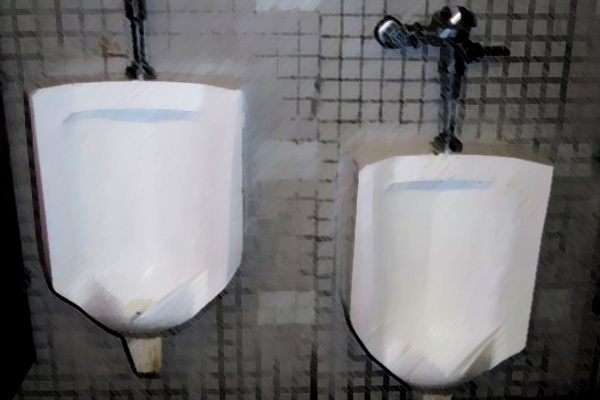 There are 2 urinals, one regular urinal (normal height), and one smaller urinal (lower – kid height). I step up to the regular urinal, unzip and wait! I look at my watch to grab the time 3:22. “Okay, 3 minutes and counting!” I think to myself. This is Target, it IS busy, especially with Thanksgiving coming next week… So it’s bound to get insane foot traffic. I wait patiently. When’s the door going to open? I can hear people talking, chatting, laughing… Must be a break room nearby? I stand there. 1 Minute passes. Then 2. It briefly enters my mind that if I DID need to go, I probably could, right there, standing at the urinal, at Target, on a busy Saturday. CRAZY THOUGHT! It’s like I’m almost giving myself permission to pee! Who would have thunk? After 4 Minutes I end it. I flush, zip, and make my way to the sinks. I certainly thought that as I walked away the door would open, but nope. No one! No one came in the entire time I washed, dried, and checked myself in the mirror. I’m just taking my sweet ole time. No matter what happened, I’m happy with myself. My goal was 2 bathrooms and 2 urinals, and I did just that! I accomplished my goal and I didn’t wimp out! I’m proud of myself. Neither time did a guy walk in or stand next to me, but that’s okay. Bathrooms are a hit and miss! What’s interesting to note is this: I COULD have peed at that urinal. I could have. It’s weird to think about. I really could have gone in, casually peed, and left without every encountering a soul. Pee Shy or not, I could have done it (if I needed to). Next week, I’m upping the ante. My goal is 3 Bathrooms, 3 Urinals! Just to stand there. Desensitize!